Cute Monsters Attack is another game by VIKINGS PRODUCTIONS that is being reviewed on this site. The other one is Space Marmoreus, and we also have an interview with VIKINGS. 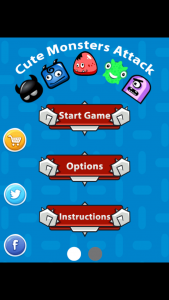 Cute Monsters Attack (Android) is a game similar to bubble shoot games. You have a group of cute monsters attacking you, and you have to shoot at them with the same color and shape block. This is an example of the gameplay. There are shapes at the bottom of the screen that can be shot at the cute monsters above. You have to match the shape and color, as it is a blue square aiming at a blue square cute monster. If you use the wrong color or shape, it spawns another cute monster, and puts you at a disadvantage. 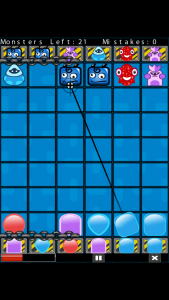 The goal is to clear a level (see “Monsters Left” in the upper left corner) without letting the shapes at the bottom touch the cute monsters at the top, as after a certain amount of time, a new row of both is added. There are currently 12 levels in 3 different difficulty groups, which is the campaign mode. There is also a custom endless mode, which you can set how many different cute monster types there will be and how much time you get to shoot, allowing unlimited customization to suit your playing level. This game is a fun game, with 12 levels to try and beat. 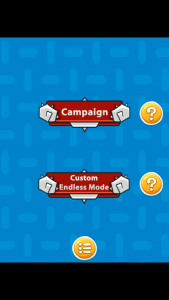 It also has the custom endless mode, which allows even more fun with the game. Shooting blocks at cute monsters never crossed my mind until I played this game, and I enjoyed it. 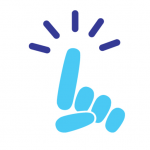 The game is very simple to pick up and you only need one finger on the phone screen to successfully play the game. This is a game that will stay on my Samsung Galaxy Grand Prime for me to play in the future!